Original Content: Okay! Let's Read Some Mainstream YA! 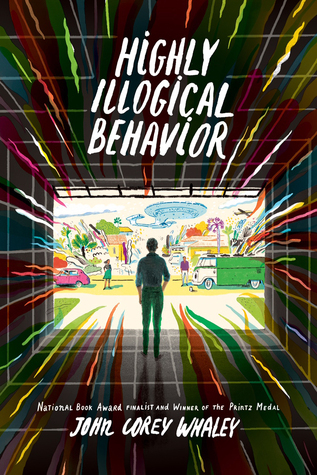 Highly Illogical Behavior by John Corey Whaley is sophisticated, mainstream YA. Probably a problem book, but not preachy about it. Solomon Reed is a teenage agoraphogic. Lisa Praytor is a teenager with ambition--she wants a psychology scholarship and believes that "treating" Solomon will provide her with material for a foolproof essay to go along with her scholarship essay. Solomon feels bad about what his situation does to his parents, and lets Lisa into the house to try to ease their lot. This book has great character motivation. Readers can believe that Solomon and Lisa could connect in the way described. I often talk about how writers should give characters goals. Lisa is one of the most obviously goal-driven characters I can recall. The author also does something very different with the romance angle in this book. The male love interest has some, what seems to me, very logical motivation for his behavior. So while the book is called Highly Illogical Behavior, what I liked was the logic behind the writing. A good choice for readers wanting a break from YA genre.